Emil Nolde was born Emil Hansen in the village of Nolde, an area of North Germany near the Danish border, in 1867. The son of peasant farmers, he showed artistic promise at an early age and could frequently be found painting and drawing. When he was seventeen, Emil apprenticed to the wood-carver Heinrich Sauermann in Flensburg. To practice and improve his draughtsmanship, he also took evening classes at a nearby art school. After completing four years of training, Nolde became a furniture designer, working for various factories in Munich, Karlsruhe and Berlin. In 1892, Nolde took a post teaching industrial design at the Saint-Gallen crafts museum in Switzerland. For the next five years, he taught and traveled, when time permitted, to Milan, Vienna and Munich. Hiking through Italy, Austria, and Germany, he developed a fascination with mountain landscapes. A series of novelty postcards depicting the Alps as characters from fables and fairy tales, produced in 1894, brought Nolde recognition and a steady income. Encouraged to become a full-time artist, he moved to Munich to enroll at the Munich Academy of Art. Unfortunately, the Academy, then under the direction of Franz von Stuck, rejected Nolde’s application. Undeterred, he studied privately with Friedrich Fehr in 1898 and with Adolf Hölzel in Dachau the following year. Nolde’s early works were an amalgam of Symbolism and Realism, inspired by Arnold Böcklin and Wilhelm Leibl. A semester at the Académie Julian in Paris, in 1900, exposed Nolde to Impressionism. In 1901, Nolde moved to Copenhagen where he met his future wife Ada Vilstrup, whom he married a year later. On the occasion of his marriage, he changed his surname to Nolde, in homage to his birthplace. 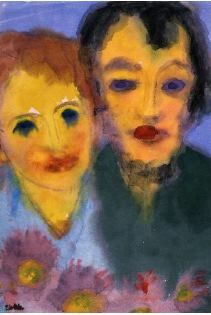 From about 1905 onwards, Nolde and his wife divided their time between Berlin and the North German island of Alsen, summering on the island and spending their winters in the city. Absorbing the influences of Post-Impressionists such as Van Gogh, Edvard Munch and James Ensor, Nolde began to hit his stride. At the Berlin Secession exhibition in 1906, his art caught the attention of prominent collectors, including Gustav Schiefler, who would later publish the catalogue raisonné of Nolde’s prints. Later that year, after a showing of some of his works in Dresden, he was invited to join Die Brücke, the artists’ community founded by Karl Schmidt-Rottluff, E.L. Kirchner, Erich Heckel, and Fritz Bleyl. He accepted, but the affiliation was short lived. The group’s communal orientation conflicted with Nolde’s solitary temperament. He resigned in 1907, but remained on good terms with the group’s members. Hereafter, Nolde often withdrew to work by himself on the moors and at the seashores of North Germany, and his art reflects the duality of his living arrangements. Seascapes and landscapes were produced in isolation, while Nolde’s urban subjects depict the cafés, cabarets, variety theatres and night clubs that he frequented in Berlin. In 1908, the Cassirer gallery in Berlin exhibited ten Nolde paintings. That same year, he was elected to membership in the Berlin Secession. Less than two years later, however, the Secession rejected all of Nolde’s submissions, as well as those of the Brücke artists. Nolde’s radical primitivist treatment of religious subjects did not please the Secession’s older and more conservative members. He complained bitterly of his exclusion and, in an open letter, attacked the Secession’s leadership (then under the direction of Max Liebermann) and its principles. For this transgression, Nolde was permanently ejected from the organization. In response, he, along with the other rejected artists, formed the Neue Sezession in 1910. Nolde exhibited with this group until 1912. Like other German Expressionists, Nolde was extremely interested in primitive art and was greatly influenced by time spent at the Museum für Völkerkunde in Berlin. In autumn of 1913, by invitation of the German Colonial Ministry, he fulfilled a life-long dream, traveling to the South Pacific and Southeast Asia, where he finally witnessed first hand exotic locales and “primitive” peoples. This life-changing journey to the South Seas ended with the outbreak of World War I in 1914. Nolde’s travels provided him with subject matter for years to come. Modern urban subjects were hereafter banished from his work, as the artist focused on religious subjects, primitive-influenced mask-like portraits and especially, seascapes and landscapes. As he aged, Nolde sought to separate himself from outside artistic influences, and, working in near seclusion, pushed his works to near-abstraction, reducing landscape to its elemental essentials. During the 1920s, Nolde enjoyed wide recognition. A biography was published in 1921; the first volume of his letters in 1927. He was also honored in 1927 by an official exhibition in Dresden celebrating his sixtieth birthday. That same year, Nolde moved to Seebüll, a quiet town near the Danish border, where he designed and built a house and studio. In 1931, he was appointed a member of the Preussische akademie der Kunste and published the first volume of a four-volume autobiography, Das eigene Leben. However, the political tide was turning, and Nolde, though sympathetic to the Nazi party (he had, in fact, sought membership in the Danish wing), found himself at odds with the movement’s aesthetics. Pressured to quit his post at the Akademie der Kunste in 1933, Nolde refused. Though the students rallied behind him, they could not stop the government’s machinations, and he was expelled in 1934. By 1935, German museums had removed several of his paintings. Nolde’s outcast status was cemented by his inclusion in the “Degenerate Art” exhibition of 1937. With thirty-two paintings, Nolde was the most prominently represented artist in the entire show. His rejection by the Nazis weighed heavily on Nolde. Identifying with Hitler’s nationalistic fervor and his “blood and soil” mythology, he wrote a letter to the minister of propaganda, Joseph Goebbels, expressing his love of all things German, and comparing himself to the great German artists Dürer and Grünewald. However, Nolde’s attempt to convince Goebbels of his bona fides was unsuccessful. Over a thousand of his works were confiscated in the campaign against “Degenerate” art. In 1941, Nolde was banned entirely from painting. Even after being issued the Malverbot (painting prohibition) by the Nazis, Nolde continued to paint, using watercolor because he feared that the smell of oil would give him away. Nolde’s forbidden works from this period, consisting of 1300 small watercolors painted directly on wet paper, are known as the “Ungemalte Bilder” (unpainted paintings). The subjects--mainly seascapes and flowers--demonstrate the artist’s unrelenting romanticism. Nolde was honored after World War II, receiving the German Order of Merit, the country’s highest civilian decoration. He published the remaining volume of his autobiography and witnessed exhibitions in honor of his 80th birthday in Berlin, Kiel, Hamburg and Lübeck. Over the last ten years of his life, Nolde worked to translate the “Ungemalte Bilder” into oil paintings. In 1946, he and his wife established the Ada and Emil Nolde Foundation in Seebüll, which transformed the artist’s house, studio and beloved gardens into a museum. Nolde died on April 13, 1956, at the age of eighty-eight, and was buried next to Ada in the garden of the Seebüll estate. Nolde’s breakthrough to a singular style came around 1909. For years, his bright, intensely colored works have attracted attention and admiration, but today he is almost better known for his revolutionary watercolor technique. Painting directly on non-absorbent paper, Nolde dispensed with contours. The spontaneous drips and bleeding that resulted became part of the final composition, as did the white areas of paper that remained untouched by paint. Nolde regarded what he called the “pictures of legends and biblical paintings” as the peak of his life’s work. There are roughly fifty such paintings in his oeuvre, dating from 1909 to the 1920s. Aside from his revolutionary watercolors, Nolde is widely considered one of the finest intaglio printmakers of Die Brücke. He employed a unique brush technique to treat the copper plate, which produced rich tonal effects and textures. Schiefler’s catalogue raisonné describes 231 etchings, 197 woodcuts, 83 lithographs and 4 hectographs. Most of Nolde’s etchings were created between 1904 and 1911, with subsequent bursts of activity in 1918 and 1922. Woodcuts were made in 1906 (notably when Nolde was made a member of Die Brücke), 1912 and 1917. The lithographs date to 1907, 1911 and 1913. Nolde’s printmaking came to a virtual halt after 1926.